Kaifeng Zhang, Yaping Luo, Peng Zhou, Reproducibility of characteristic marks on fired cartridge cases from five Chinese Norinco QSZ-92 9 × 19 mm pistols, Forensic Science International, Volume 278, September 2017, Pages 78-86. Principal Investigator: Jeri Ropero-Miller, PhD, F-ABFT, FTCoE Director, Director, Center for Forensic Sciences, RTI International, NIJ Contact: Gerry LaPorte, MSFS, Director, Office of Investigative Sciences, National Institute of Justice, Forensic Optical Topography, A Landscape Study, December 2016, Pages 17-18. Jan De Ceuster, Sylvain Dujardin, The reference ballistic imaging database revisited, Forensic Science International, Volume 248, March 2015, Pages 82-87. “A reference ballistic image database (RBID) contains images of cartridge cases fired in firearms that are in circulation: a ballistic fingerprint database. 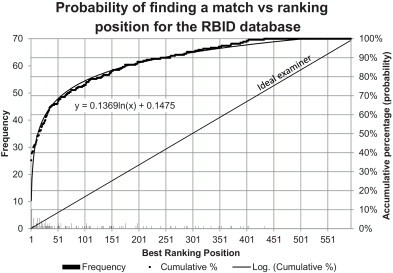 The performance of an RBID was investigated a decade ago by De Kinder et al. using IBIS® Heritage™ technology. The results of that study were published in this journal, issue 214. Since then, technologies have evolved quite significantly and novel apparatus have become available on the market. The current research article investigates the efficiency of another automated ballistic imaging system, Evofinder® using the same database as used by De Kinder et al. The results demonstrate a significant increase in correlation efficiency: 38% of all matches were on first position of the Evofinder correlation list in comparison to IBIS® Heritage™ where only 19% were on the first position. Average correlation times are comparable to the IBIS® Heritage™ system. Christina Gonzalez, OC Crime Lab Goes 3D, FOX 11 Los Angeles, Posted: Feb 04 2015 08:05PM PST, Video Posted: Aug 12 2015 06:04PM PDT, Updated: Feb 04 2015 08:52PM PST. “The Orange County Crime lab is going 3D. It’s not movies they are watching, but patterns on bullets – casings and actual bullets from crime scenes in cold cases all over the county. 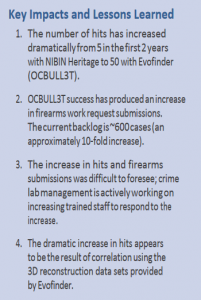 It is the first crime lab using the system, and now they have their first “hit”. Joachim Rahm, Evaluation of an electronic comparison system and implementation of a quantitative effectiveness criterion, Forensic Science International, Volume 214, Issues 1–3, 10 January 2012, Pages 173-177. “The identification of fired bullets and spent cartridge cases is one of the key tasks of forensic science. The traditional comparison of signatures on specimen with a large collection with only a microscope is a very tedious and time-consuming work. Fortunately, electronic systems for performing a pre-selection have been invented since the last 25 years. On the basis of an expansive database the electronic comparison system used by the BKA, Germany, is evaluated and a mathematical value is proposed to rate the correlation quality. 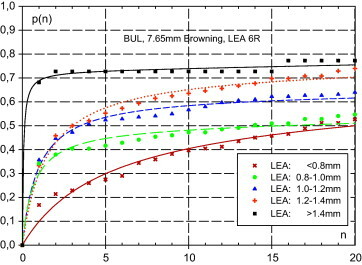 This effectiveness criterion can be valuable to give an objective assessment of different electronic comparison systems.